From U.S. 70, East or West, take U.S. 117 South to Arrington Bridge Road turn left onto it. Go to Westbrook and turn left onto it. Go to Slocumb Street and turn right onto it. Slocumb Street will take you straight to the back gate. You must use the back gate for security purposes.. The nearest major city to the area is Raleigh, N.C. ---- NOTE: After hours arrival - All transit will take place through the Berkeley gate. We ask that personnel call the ECC, 722-1212, giving us a minimum of 30 minutes notice they are going to be arriving to Berkeley Gate. For Sprint Air Card users, there is excellent EVDO signal with high speed access. Allowed. You can walk them in the woods. Be aware that the water hookup is on the patio side. You may need 20'+ of hose to reach the water spigot. 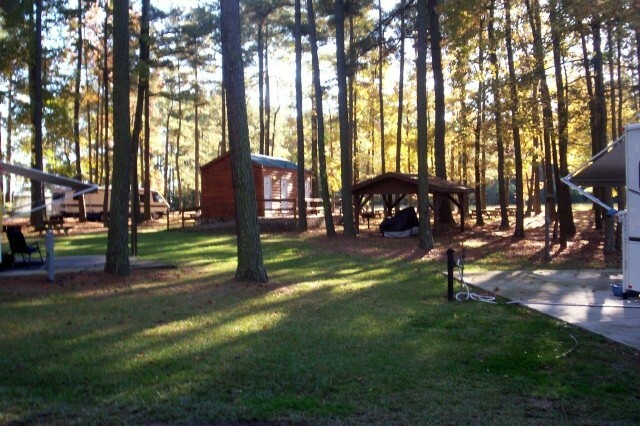 The campground is four blocks from all activities. Very secluded and clean. Wifi was actually pretty decent as well. The only real issue I have is with how they handle assignments. They don't take reservations which makes things a little more difficult but they will also give your spot to someone else if you pull your camper of of the spot for even a few minutes, even if you have paid (they will refund you money)! You have to occupy the spot continuously. Me and my wife spent 3 days here and it was very nice. Clean and well out of the way from the rest of the base. close to the exchange, commissary, gas station and shoppette. They have added 6 new pull thru spots that have full hook up and on a concrete slab. We will be back again in the spring. This is a convenient location on base close to base shopping as well as local eating, shopping, etc. we went to Post Exchange and found pretty much what we needed plus got a coupon for 20% off gas at the BP next door! Reservation staff are nice but seems to be some confusion about process. We called morning of arrival to see if any sites were available. Were told one would be leaving and checkout was noon. Asked if could hold for 3 hours and if we weren't there by noon, we forfeit. Sorry could not save sites. When we arrived at gate called again to make sure something was available. Was told someone was supposed to be coming in next day (we wanted 2 nights) but had not yet arrived. Got to site # and there was cone there. What happened to no holds? Of course we moved the fine and took the site since we had an assigned number. Our receipt said full hookup but found it was W/E only. Next day we noticed several in overflow, so guess they were waiting to us to leave. We did get decent reception with our window Satellite but never able to get wifi even though we were given a password. Sites were concrete and level with nice picnic table and quiet wooded area. Did not use bath house. For the price, it is a good value for short stay. It is a way off the interstate, though, so if $$ part of decision, Passport America holders can get same price at Kperd Inn in Wilson and not have the extra hour drive time. They are in the process of adding six more sites at the rear of the existing ones and when they are done with them the front sites will get a paved road as well. Trees are down, road and sites are sandy bases with power poles in most of them at this point. 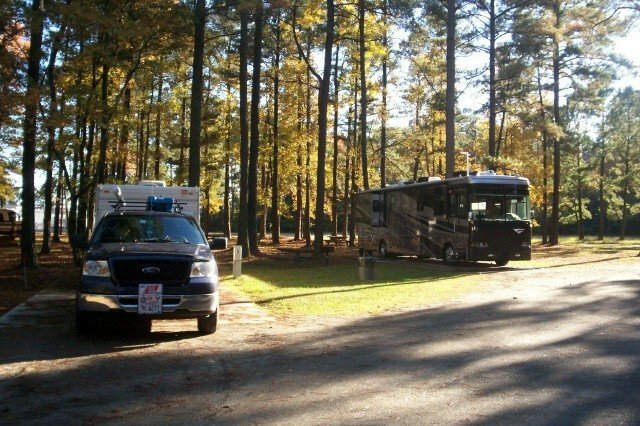 $17.50 per night and I stayed two nights with a 38' motor home with no problem getting situated for the night. A very acceptable stay and very unlike earlier reviews that almost put me off going there, in fact I would not hesitate to use it again in the future. The walking trail I was told about by someone there could stand to be marked. UPDATE 8/15/15 the new sites have been completed and the roads have all been paved. 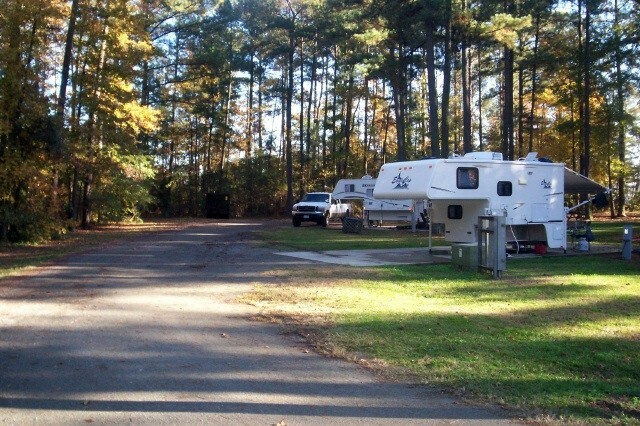 Beautiful, quiet campground nestled in the woods on the edge of the base. Nice walking trail into the trees. Rustic look to the restrooms and picnic shelter. Extra picnic tables in the middle are nice but the trash is overflowing. Yes, the water is on the opposite side but there's good voltage and water pressure. Sites are spacious with concrete pad and, except for Overflow, with sewer on the pad. Restrooms are in a trailer, a private one for each gender. Laundry has one washer, one dryer. All were reasonably tidy but dirty and showing wear and tear. Our 30A service was broken but 50A worked. There's the appearance of neglect everywhere. Eight sites are FHU, another two are called Overflow and share a sewer connection and a third Overflow spot is on the grass with just W/E. The two Overflow sites that share the sewer have long-term occupants. For $9.50/night no wonder! I question occupying those sites when there are FHU sites available. That's $285/month for what amounts to full hookups. Don't forget to stop in at Outdoor Recreation to pay and find a site. This was a nice campground in a woodsy area. Small sites, but concrete pads made it very nice. We had poor cell phone coverage (T-Mobile), but when we walked over to the commissary I got a few bars. Restrooms were very nice and I didn't use the laundry room, but it appeared clean with nice machines. I didn't even check to see what was available outside of the base, but on base was great. We were within walking distance to the commissary, PX, and bowling alley :) All and all, we will definitely return. Our last visit here was about 10 years ago. 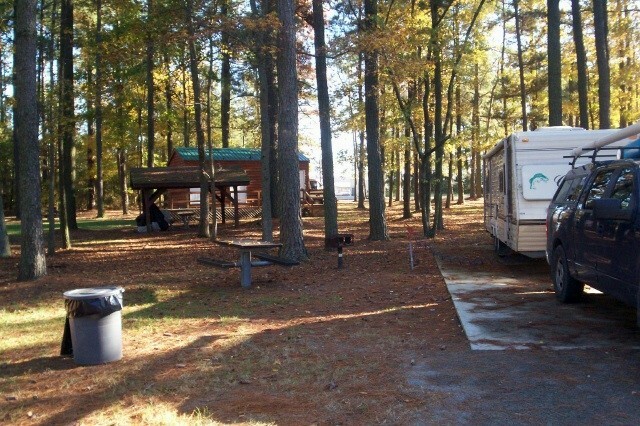 Since then the campground has enjoyed some improvements: a new laundry/bathhouse and cement parking pads. I called the day before our planned arrival and Kim at MWR said there were two sites open. When we arrived there were 5, although 2 had cones in front of them and "site occupied" signs on them. Since our stay was on a Saturday night, the MWR office was closed. Kim had said there was a payment box outside the MWR office. We went by Sunday morning as we were leaving and found a box; however, it was labelled as a mail box. I slid my payment envelope through the edge of the door. Hope they found it Monday AM. They should consider putting an Iron Ranger in the Campground. For $15, this is a good deal and we'll undoubtedly stop by again. 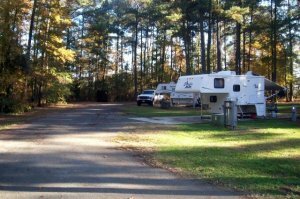 Ted H.
This small campground is located in a heavily wooded area which blocks satellite TV signals. The sites have a concrete pad and are level with full hookups. A laundry (1 washer, 1 dryer) and bathhouse are nearby. It is quiet until the kids get home from school. There are several active duty families that are homesteading here and the kids don't have many options. The interior one-way road is dirt and gravel and was muddy and filled with potholes while we were here. We called ahead to ask about availability (no reservations are taken), we were told that the place was full. We came anyway and found an empty site. For $15 a nite, I shouldn't complain. We called in one hour prior to arrival and they thought they had two sites available. On check-in we were told to check the camp as they were not sure that any were available. 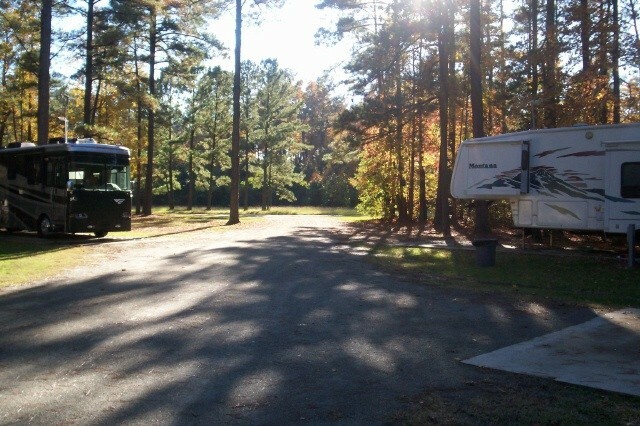 When we got to the campground, there were four open sites. We stayed in site #8 and to our surprise, we had satellite if we pulled to the edge of the road. They have solved their trash problem with the addition of a dumpster. The rest rooms were clean and the laundry room was immaculate. They have a civil engineering crew that now handles the grass cutting. This woodsy campground was clean and had all slots filled during our stay. Improvements will bring me back again. Nice small CG, forget about Satellite and very little local over air antenna. Verizon reception is good with the exception of Hot Spot drops every once in a while. Folks at the Outdoor Recreation are very nice and try to help. Don't know about the ladies bathroom, but the men's bathroom has no heat and the shower leaks onto the flooring which feels as though is going to cave in when you first walk in, probably due to the fact that the shower does not drain properly. I would recommend to them to use the clear area adjacent/across the CG and establish some full hook up sites so that folks can get satellite and better reception. They no longer have trash cans about and can't really blame them, there is now a dumpster which is less than 100 yards from any of the sites. 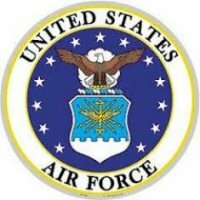 Both commissary and exchange are within walking distance so is the bowling alley and gas station where they have a Shoppette (Air Force term for 7 day store). Exchange is very small, but they do have what you need. Overall a good experience. By the way, stop by the Bowling Alley during lunch, great burgers and sandwiches. CG is in a nice wooded setting. Great for walking your dog in the woods. The bathrooms had no heat and during cold weather needed to take showers in your own camper. Men's bathhouse floor is caving in from rotting wood floor because shower runs over into floor and floods the bathroom. No campground host but people friendly in outdoor recreation building where you need to go to pay. $15 nightly. Told rec dept. of problems but said they had to tell someone else of problems to get things fixed so I guess it will be wait and see. Arrived at Seymour on Saturday June 12 for two days. Had checked on Friday and they had three sites available. They are not open over the weekend and you need to leave your check in their mailbox unless you want to wait for them to open at 9AM on Monday. Nothing has changed. There is no camp host, but this is not a problem with such a small campground. Trees obscure satellite reception at most sites. The laundry room was clean with air but had no soap products to buy. Campground was clean but the trash receptacles were full. The library is no longer open on Sundays, so you can't keep up on those things we need the internet for. They have lowered their price to $15 per night but this is still high with no cable or WIFI available. We stay here because nothing else is available in the local area and the kids and grandkids are close by. W.T. left this review using the Directory software: We arrived on a Sunday morning to find 10 clean, shaded sites in the tall pines, only one of which was occupied. All had 30/50 amp, water and sewer. There was no host - a sign at the entrance advises to call the office at 919-722-1104. We selected south-facing site #3 and received a satellite signal and a 5-bar Verizon phone signal. The small bath-house was clean, with one washer and dryer ($1.00) in the laundry room. The grass between sites had been freshly mowed. The only minor negative about this FamCamp is that, with the exception of sites #9 & #10, the water spigot is on the curb-side of the coach, requiring a 25-foot hose. There is no WiFi or cable, no hot tub, pool or club house, but the FamCamp is conveniently located near the base facilities - walking distance to the Commissary and BX. for a one-night stop on our way north. As for internet access, we have a SPRINT AIR CARD and 3G EVDO reception here was excellent for high speed access. This is a tough one to write. The problem with this campground is the people that have been homesteading there forever. One has three dogs that never stop barking, and they don't care. Site #3, the one we pulled into, almost finished setting up and learned the power didn't work. The office had a work order in to fix it, would have been nice to know when we called before we arrived. There is no wifi, cable, and only one washer/dryer. The bathrooms could have been cleaner, but not to bad. We talked to one person, and he said he stops by once a month, and the same people had been there for 2 years. It didn't have the look of a famcamp that had homesteaders. I would say this is a campground you only use as a stop over. I would only stay here two days. After reading some of the older reviews, I figured, what the heck, I am only staying one night and it is just a place to sleep. I was pleasantly surprised. Someone must have taken notice and cleaned it up. It is a very clean, pleasant campground. Sites are level with concrete pads. Overflow sites and 9 and 10 have a sewer hookup between them, so guess it is who ever gets her first gets to use it. The only disadvantage I could see was the water was on the wrong side, but that was no big deal. Most of us carry at least a 25 foot hose. I did not go onto the base to check out exchange or commissary, so can't comment on them and that is why I gave Amenities/Facilities a 1. I would definitely stay here again. Even though we used the book and called Outdoor Recreation on our way in, we did not get any indication that we should go directly to the campground and choose a site prior to going to the office. Since the campground address is not in the book, only return guests would know how to get there because there are no signs on the base directing you to the park. As noted in another review the water hook-ups are on the wrong side of the sites. Even though we were not able to use our satellite TV we enjoyed good reception with the antenna, so all was well. It started raining just as soon as we arrived and has not stopped yet, so I was unable to check-out the minimal facilities in the park, therefore they are not rated. We found the Outdoor Recreation staff to be of marginal service regarding information and directions. I would agree with another reviewer that this is an okay overnight stop, but not a destination place. Still no camphost! The trash cans at this campground were not emptied for the three days and were overflowing onto the ground. The sites had pine needles at least a foot deep and appeared to be untouched for months. The rest rooms were clean but had no paper towels in them. The water hookups are on the wrong side of the site and ours was leaking underground making our site a swamp. No one visited the campground from the outdoor rec office at all. There are no signs directing you to the office in the campground. The parking pads are concrete and in good repair but the roads are gravel with large pot holes. Campground is small and was not expanded as was reported by someone earlier. It is ok for overnight but not a destination campground by no means. Could be a great little campground with some better management but far from it now. I suggest a campground host be hired to stay in the campground. We stayed at SJAFB after the Thanksgiving Holiday and the garbage pails were not emptied until Monday. Could not pay fees until the 4th day as the MWR is not open for the troops during the holidays. My comments from my June visit are being used in your description. The library is only 4 blocks away and you can use their computers for email and any other business you need to accomplish. Was able to pick up the Satelite for Direct TV in site 2. Some of the others would be impossible as the 40' pines will block it out. Still a very peaceful place with all backins. Think they ought to take a look at 10-12 dollars a night instead of 15. 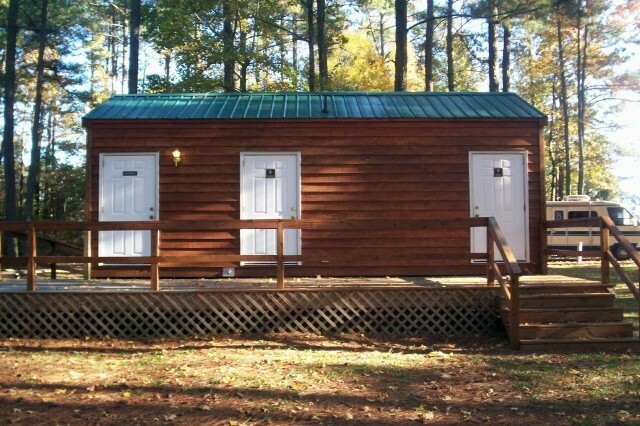 We can get all amenities at $12-$14 a night at Passport America sites.